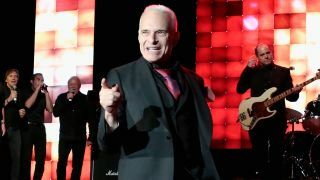 Former Van Halen vocalist David Lee Roth surprised the crowd at the Ultra Music Festival in Miami over the weekend by appearing onstage with DJ Armin van Buuren. The result? A remix of Van Halen’s classic Jump which is quite a departure from the 1984 original. Check out video footage of the performance below. Speaking about the collaboration with Rolling Stone prior to the show, van Buuren said: “I’m sure that a lot of the kids I’m gonna play for are probably not even familiar with the original and how big of a track it was when it was released. Roth adds: “It’s visceral. It’s sort of like when your dog knows you’re drunk. In your gut, you know exactly what it’s about, and the song’s deeper meaning is being able to do something when you’re a little bit unsure.